Ingredients: 1/2 cup oats, 3/4 cup almond milk, 1/2 mashed banana, 2 tbsp vanilla whey, 1/2 cup canned peaches, 1/2 rice cake, 1/2 cashew LarBar (chopped up), 1 tbsp honey. 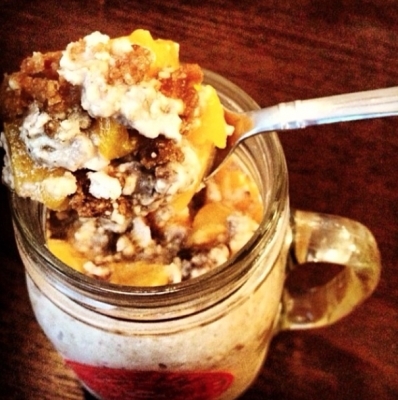 Directions: Mix all above ingredients in mason jar (except 1/4 cup peaches, rice cake, honey and LarBar)... Refrigerate covered overnight, in morning dice peaches and add to top, break up rice cake and mix with honey and LarBar to get that "cobbler" effect, and mix in to oats. You can heat in microwave, but also tastes great cold too!